about DDT and peregrine eggs. shows a raptor patient x-ray. 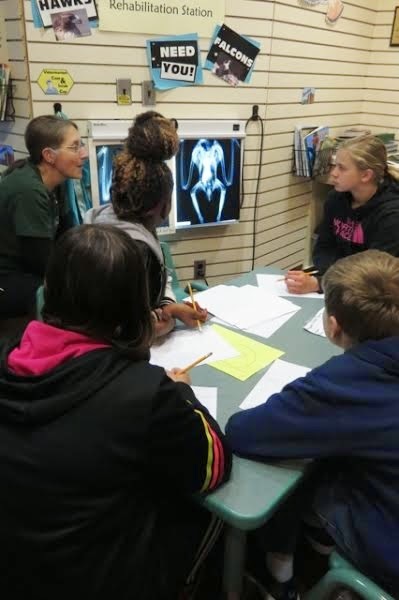 The Raptor Center hosted several middle schools at our site recently. The students engaged in several hands-on learning opportunities such as critical observation and sketching of raptor artifacts and some of our winged ambassadors, meeting our clinical interns and learning what it is like to do a physical exam of a raptor patient, and how bird banding can teach us links to birds and our shared environment. These visits are part of an ongoing curriculum integration program to create opportunities for schoolchildren to deepen their engagement with environmental topics. Rockford Middle School was the first to partner with The Raptor Center. Over the past four years we have partnered together, instructors have shared the impacts these multiple-visits have had on their students. Students learn critical scientific investigation skills presented as part of the integration program, as well as applications for real-world problem solving within environmental frameworks. The Raptor Center has appeared at events that Rockford hosts for parents and community members to view and experience the events taking place at the school. Rockford was also recently designated as a Department of Education Green Ribbon School. Students and staff are devoted to reducing waste and lessening their environmental impact. Exploratory classes created a waste challenge. Education about organics recycling among students and staff diverted 47 tons of organic waste from a landfill into compost.